Must-See TV Alert! 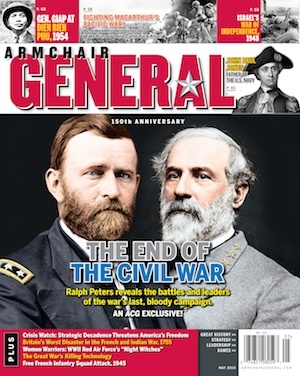 Patton 360 – on HISTORY | Armchair General Magazine - We Put YOU in Command! They called him “Old Blood and Guts.” Brash and brutal, feared and fearless, and decidedly not politically correct, General George S. Patton, Jr. was perhaps one of America’s most controversial World War II patriots. Now, a new HISTORY™ series explores this larger-than-life military icon in PATTON 360, an action-packed 10-part series currently running on HISTORY. PATTON 360 marches in on the heels of the fast-paced hit series BATTLE 360, using cutting-edge animation, archival footage, and interviews with veterans of Patton’s Army to immerse viewers into the battles of World War II. Following Patton’s battle trail through two continents, we see the war as Patton and his hard-fighting troops did, from the fox holes of North Africa to the battlefields of Normandy to the horrors of Nazi prison camps. Armchair General readers would be interested to know that our founding editorial director, John Antal, is featured as one of the on-camera experts. Patton’s forces embark on the road to Germany by invading North Africa. Pro-Nazi French forces put up surprisingly strong resistance on land, at sea, and in the air. After three days of intense fighting, a cease-fire is declared, and Patton triumphantly enters the port city of Casablanca. But bigger battles with the German Army loom on the horizon. When the Germans deliver a humiliating defeat to American forces under the command of General Lloyd Fredendall at Kasserine Pass, Eisenhower appoints Patton to take charge. “Old Blood and Guts” whips the poorly-trained troops into shape, leading them to victory at the Battle of El Guettar. With the Axis forces in full retreat, Patton and the Allies push the enemy off the continent and declare victory in North Africa. Patton is given command of the Seventh Army as the Allies prepare to invade Sicily. Known as Operation Husky, the combined amphibious and airborne assault is the largest invasion of the war to date. Despite a surprise counter-attack by Italian tanks, Patton and his allies successfully hold the beaches and prepare to push inland. Frustrated by the slow progress of his British allies, Patton ignores orders to stay by their side and pushes on to capture Palermo. The Seventh Army prepares to assault Messina and liberate the besieged city before the British do. But instead of a hero’s welcome at Messina, Patton is relieved of command for slapping two shell-shocked soldiers. His battlefield command days may be over. Patton’s victories in Sicily are overshadowed by the infamous “slapping incident.” Instead of leading the D-Day invasion of France, Patton is assigned to command a fictitious army in England as part of a ruse to fool the Germans. The deception pays off, and the Allies land on the beaches of Normandy. Patton helps plan the break-out from the weeks-long battle, and American armored forces blast through the German lines. Patton is finally able to lead some of the lightning-fast armored assaults he is famous for. As American forces tear through western France, Patton’s superiors order him to stop before completely trapping an entire German Army. The Third Army reaches the outskirts of Paris, but Patton is denied the glory of liberating the city when the Free French Army is chosen instead to enter the city first. Patton’s men engage in street fighting in the city of Troyes and, by the end of the summer, advance to within 60 miles of the German border. PATTON 360 is produced for HISTORY by Flight 33 Productions. Executive producer for HISTORY is Carl H. Lindahl. Thanks for the info on this programming.Finally something worth watching on the History Channel once again.So sick of ufo’s,banned bible books and curse of the kennedy clan jibberish.Patton 360 most excellent indeed.